These pictures have been kindly sent in by Christine Hudson. 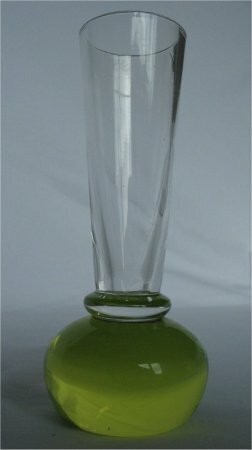 Her vase has an uranium base and is approximately 120mm (4 3/4 inches) tall. The base is approximately 45mm (1 3/4 inches) across. 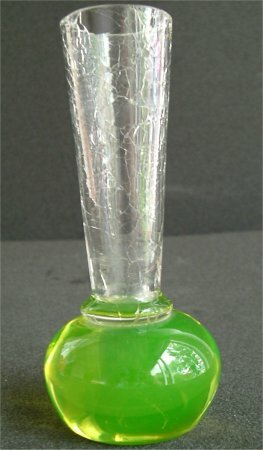 The stem is clear and has a wide flare of approximately 35mm (1 3/8 inches) and the top rim is neatly champhered. 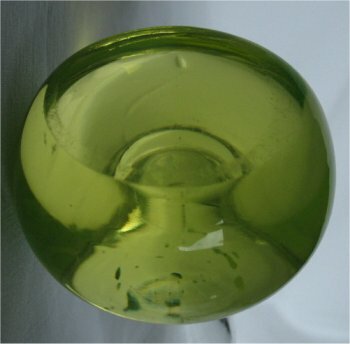 The bottom of the base has a large polished pontil which almost completely fills the base. This picture has been kindly sent in by Steve & Helen Hookins which shows a similar vase with a crackle finish on the stem.